Sensitivity to dairy products, also known as lactose intolerance, means you have difficulty digesting products derived from cow's milk. The condition is common, according to the National Digestive Diseases Information Clearinghouse, and most likely to occur in adulthood. Proponents of candida diets, or diets aimed at reducing yeast overgrowth, believe that dairy products trigger yeast production. In addition to limiting or avoiding dairy products, certain foods may help reduce yeast overgrowth and help prevent infections. Fish and seafood provide rich amounts of protein and nutrients, such as B-vitamins, iron, vitamin D and calcium. Candida overgrowth and infections are linked with low-calcium intake, according to the University of Maryland Medical Center. Since dairy products are major contributors of calcium in Americans' diets, seeking alternate sources of calcium, such as fish and seafood, may help reduce your risk for yeast overgrowth and improve your overall health. Three ounces of sardines provide roughly 1/3 of the daily recommended allowance of calcium -- more calcium than eight ounces of milk provides. Additional calcium-rich fish and seafood varieties include salmon, crab, lobster, anchovies, shrimp, bass, catfish, haddock, tuna and halibut. To maximize your calcium intake, opt for canned tuna or salmon, which contain calcium-containing bone particles. 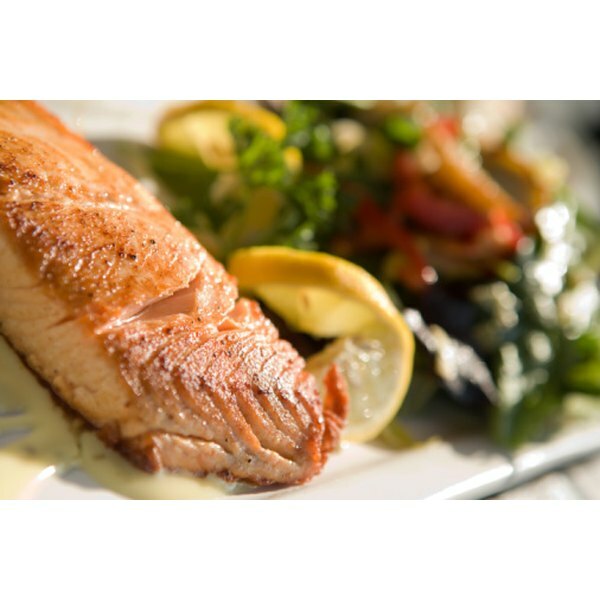 Fatty fish, such as salmon, albacore tuna, herring and halibut, also provide omega-3 fatty acids -- healthy fats that may help alleviate inflammation associated with yeast infections. Probiotics are healthy bacteria that enhance digestive health and help prevent bacterial infections. According to the University of Maryland Medical Center, probiotics may help prevent yeast infections if you consume them while taking antibiotics -- a common trigger of yeast overgrowth and infections. Probiotics may also ease digestion of dairy products. For this reason, dairy products containing probiotics, such as yogurt with live active cultures, may provide yeast-reducing benefits without exacerbating symptoms of your dairy sensitivity. Additional sources of of probiotics include kefir, fermented milk, sour kraut, kimchi (fermented cabbage), fermented soy products, certain aged cheeses and fortified foods and beverages. Fruits and vegetables provide valuable amounts of vitamins, minerals and antioxidants -- nutrients that help your body defend itself against infections and disease. Fruits and vegetables are also naturally free of dairy products, low in fat and high in fiber. The University of Maryland Medical Center recommends vitamin C-rich varieties, such as bell peppers, citrus fruits and tomatoes, in particular if you struggle with recurrent yeast infections. Other fruits and vegetables rich in antioxidants include cantaloupe, berries, cherries, apples, red plums, kiwi, spinach, kale, broccoli, carrots, squash and sweet potatoes. Turnip greens, kale, Chinese cabbage and broccoli also provide modest amounts of calcium.